Relax Notre Dame Nation. Aaron Lynch is not transferring. He got in a scuffle during Friday practice with offensive lineman Tate Nichols and apparently it was one in which punches were thrown. Lynch will come back to Notre Dame on Monday. Louis Nix is now on the second team defense with true freshman Sheldon Day replacing him on the first unit. It sounds like Kelly and his staff want more consistency out of Nix during the spring and just haven't gotten it. I still expect to see Nix starting in the middle of Lynch and Stephon Tuitt come fall. Jamoris Slaughter has been moved from his free safety position to the other starting cornerback position opposite Bennett Jackson. This move obviously means Lo Wood is not cutting it. The secondary will be the big question mark all season for the Irish after losing starters Gary Gray, Robert Blanton, and Harrison Smith to the NFL. Personally I'm not a fan of moving Slaughter to corner. Slaughter is an All-American candidate at safety and is probably the best hitter on the defense. I would rather see him facing the offense as opposed to having his back to the quarterback. Austin Collinsworth (son of Cris) will move into Slaughters starting spot at free safety playing along side Zeke Motta. The good news coming out of Notre Dame recruiting today is the commitment of cornerback Devin Butler out of Washington D.C. Butler is the second corner and 10th commitment in the 2013 class. Butler picked ND over Penn State, Michigan, and Nebraska. Expect another commitment soon from Georgia defensive end Isaac Rochell. The 5th rated strongside defensive end visited Notre Dame this past weekend and came away very impressed and ready to end the recruiting process. Rochell would be a huge get out of SEC Country as he has offers from across the nation. Now is your chance to own a piece of Notre Dame history. Last season tailback Jonas Gray averaged 7 yards per carry while rushing for 12 touchdowns during his senior season. Jonas brought back memories of ole #25 Rocket last season when he ran past Pittsburgh for a 79 yard game winning touchdown. Now you can own the same jersey he wore when coming out of the tunnel to play for the Fighting Irish. 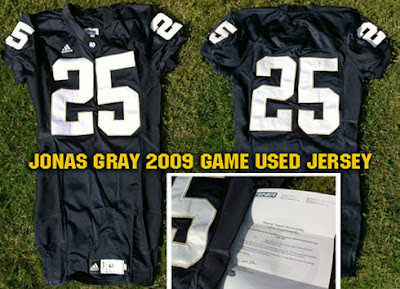 The Jonas Gray Game Worn Notre Dame Jersey comes with a certificate of authenticity from Steiner Sports along with a matching hologram. The jersey size is 42. Only 1 available! Finishing off 40-0 with a dude playing center in women's basketball: priceless. The Masters has many quirky traditions like sexism and racism but the best tradition by far is the practice round in which golfers attempt to skip a ball across the pond on the 16th. Yesterday Germany's Martin Kaymer holed one out. The crowd went nuts as you can hear from the Youtube video and Kaymer was allowed to finish his practice round. After all he is the master race: Aryan. My neighbor Scott pointed out to me the NCAA slam dunk contest this past weekend and I completely forgot to post this amazing dunk by 5'9 guard James Justice from little Martin Methodist College in Tennessee. Justice won the contest with this between the legs throw down. Somewhere Spud Webb is smiling.